What makes a saint? Why do we need them? 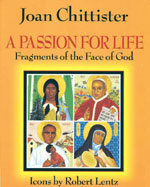 Joan Chittister presents thirty modern and classical saints, reachable figures, not without flaws, but so luminous in their virtues as to be a light for our age. Robert Lentz's stunning full color icons are feast to the eye and soul.